BIM is supposed to make things easier and more efficient, right? Then why do we often have to re-do work in different platforms, simply to get the result we want? Surely, we can do better… especially when it comes to high quality rendering and presentation workflows. I have written about Lumion a few times before. It is a incredibly powerful tool for Architects to present and share designs. However, it may still have suffered a little from the ‘endpoint syndrome’ described above. But that is no longer the case! Now, Lumion offers a Live Link to the Revit model, meaning that work does not have be done over and over again. To get started, install a trial of Lumion 7.3, and install the Lumion plugin 2.01 for Revit. Open up a Revit project. Then, simply go to the Lumion ribbon and press the ‘Play’ button. You will be prompted to launch Lumion. Press Yes. 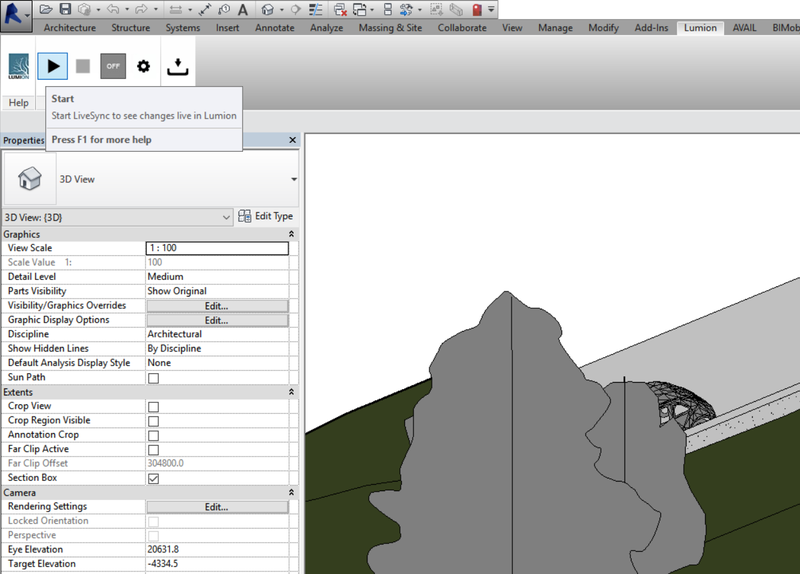 In just a few seconds, it launches showing your Revit model. Seriously, it is really fast! This workflow is so much quicker than an export – import method, and will be familiar to users some of the other popular realtime visualisation solutions out there. You can immediately start navigating in this rendered environment. And of course, you can start building your Lumion scene by adding content from the immense library. However, we really want to focus on LiveSync. How does it work? After you have completed an editing and model building session with LiveSync, what happens next? Well, you can close Revit and Lumion, and Lumion will prompt you to save. It does actually save the embedded LiveSync object. So, later, you can open Lumion and do some scene development work without using Revit. This means that using a Revit model in a consistent location will allow easy updating of the Lumion model. 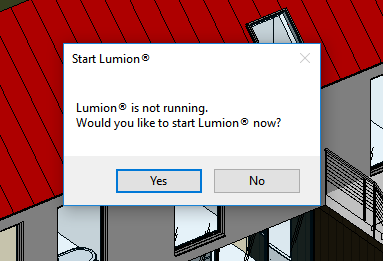 You can work independently in Revit or Lumion, and then at any time restart LiveSync to updated the model in Lumion with the changes from Revit. Nice! 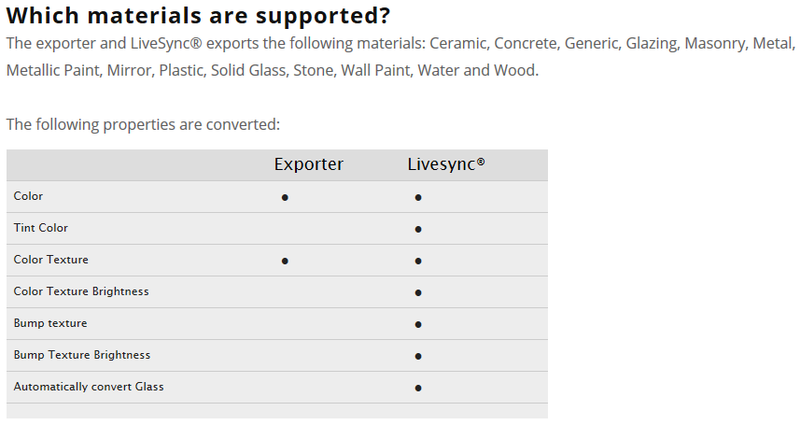 It is interesting to note that Lumion materials are essentially ‘disabled’ for LiveSync Revit objects. This makes sense of course, because we are trying to keep as much intelligence as possible in Revit, and leverage the strengths of Lumion for high quality outputs. Items in worksets that are closed or invisible by default will not show. 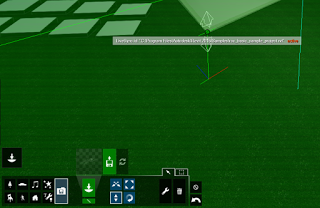 What this basically means is that the Lumion LiveSync addin does not work on the specific objects you can see in the current Revit view, but rather it works in a more ‘complete’ sense, showing all objects that would typically be visible in any view. If you are already using Revit and Lumion, these new additions will make designing much easier and more efficient. 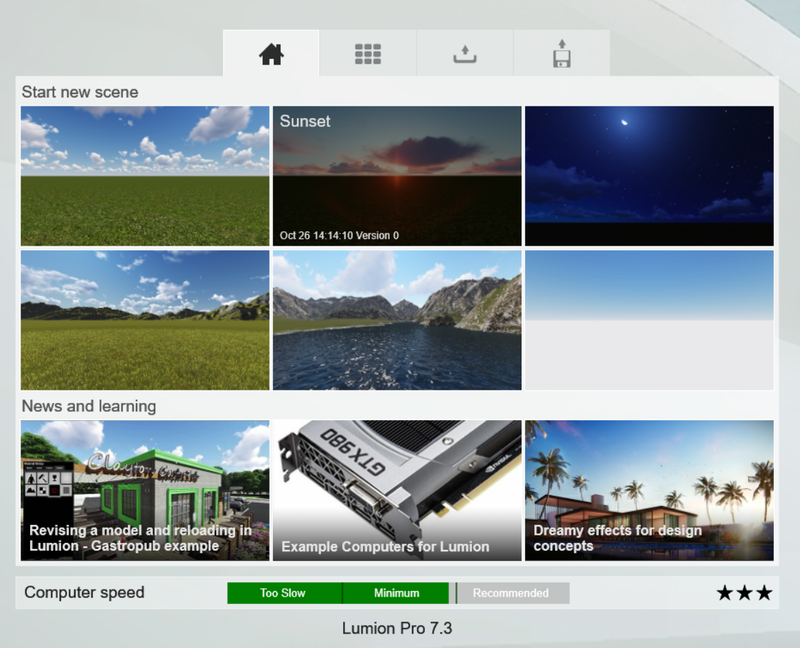 If you haven’t used Lumion before, now is definitely time to try it out! This improved connection to Revit, along with the already powerful content creation capability of Lumion, will truly allow design and present in ways you have never even imagined! To try LiveSync for Revit for free, go to this page on the Lumion.com website were you can download the trial based on Lumion 7.3 PRO. This trial includes the LiveSync for Revit. Make changes in Revit​®​ and immediately see them appear live in Lumion! Lumion LiveSync® provides a real-time high quality 3D view of your Revit® design. This plugin for Revit® creates a live connection with Lumion, so that changes in Revit® can be previewed in real-time in Lumion. Live synchronization can help you work faster, for example in the early stages of design, when you are making frequent adjustments to your Revit® model. Lumion 7.3 is a FREE update for Lumion 7 users and the Lumion® plugin 2.0 for Revit® is FREE of charge to anyone. 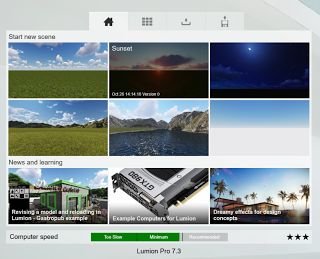 Lumion® is easy-to-use, fast, high quality visualization software for architects. It is compatible with almost all 3D CAD software packages such as ​Revit®​, ​SketchUp®​, ​ArchiCAD®​, ​Allplan® and many others. It offers a full package. With a CAD program plus Lumion you have all you need to make great presentations. It includes sky, water, an extensive library of materials, people, plants, cars and furniture and loads of special effects. Before ​Lumion​®, rendering used to be really hard. Setting up and completing a render used to take days. With ​Lumion​® you can do it in hours. You can even make last minute changes before a meeting and update your renders in minutes. Anyone can sit down with ​Lumion​® and within 15 minutes learn how to create videos, images and 360 degree panoramas.